Bagworm is a catch-all term that many home gardeners use to refer to several leaf-chewing caterpillars. We have three main caterpillars that chew on plants and cause homeowners worries. Only one can be a serious problem and that is the caterpillar that actually makes its own bag or home to protect itself as it feeds. This caterpillar is the one that can defoliate an arborvitae, Leyland cypress, or juniper before you even notice it is there and can lead to death if an evergreen is totally defoliated. This caterpillar is active in early summer and is easy to see in the wintertime as the bag is about 2.5 – 3” long, becomes brown and contrasts with evergreen foliage of plants that it may be on. The other two so-called bagworms actually make a webbed nest or bag that has dozens if not hundreds of caterpillars in it in deciduous trees. In the spring the culprit is the eastern tent caterpillar and this insect makes its webs in the crotches of trees. These caterpillars generally hatch about the same time as the redbuds begin to bloom and they create a small webbed nest that is enlarged as the caterpillars grow. Damage done to these trees is early enough in the season that the plant has time to produce new leaves to replace those lost, so no long-term damage is done to the tree. In mid to late summer the fall webworm becomes noticeable in many species of trees. These are the caterpillars that form webs at the ends of branches as they feed on the foliage. We are coming to the end of the growing season, so these insects really do no harm to the trees as they will soon be losing those leaves anyway. The damage done is generally just to the aesthetics of the tree because the webs look dirty and ugly. 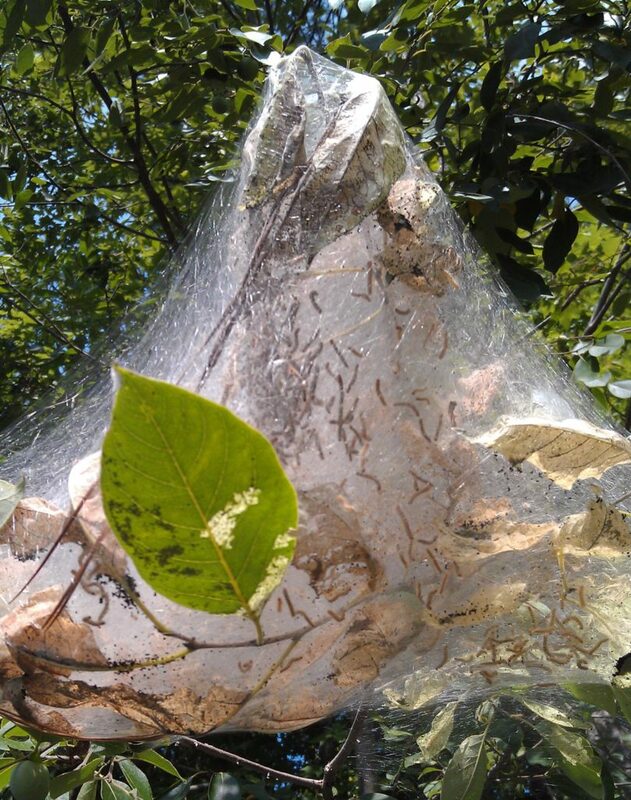 The web serves the purpose of protecting the caterpillars from parasitoids and birds, so one easy way to manage them is to simply rip the web open to expose the caterpillars. Another method of control is to simply prune out that section of the branch and bag it for the trash. The tree will suffer no permanent damage, so no chemical sprays are recommended. Stop by and visit the Extension Master Gardener℠ volunteers of Union County at their Teaching Garden at the Agriculture Center on Saturday, August 25. They will be hosting a Ask a Master Gardener℠ volunteer booth from 9 – 11 a.m. You can come and ask questions and bring samples for help with identification or diagnosis. While you are here, take a stroll through the gardens. You may pick up some ideas for plants or techniques you may want to try in your own garden. • Bagworms or Fall Webworms?